A 4 mile walk from Oval tube station (Northern line) through Vauxhall and across Vauxhall Bridge then via Pimlico to Westminster tube station. There is a choice of routes beyond St John's Garden (see below). The walk takes in a number of green spaces. This was the Roman road of Stane Street to Chichester, now the A3. St Mark's Church is one of the 'Waterloo' churches built in 1822. It stands on the site of gallows where Jacobite rebels were executed in 1745. Further along on the left is the former Belgrave Hospital for Children. The building of c1900, by Charles Holden, was converted into flats in the 1980s. Go right into Hanover Gardens (a pleasant enclave) and around Elias Place. Right along Claylands Place, right at Claylands Road, left at Trigon Road, right along Fentiman Road. The Methodist Church was built in 1900. The almshouses just before the park were founded in 1618 by Noel de Caron and rebuilt in 1854. This park was laid out on the grounds of the Lawn (former home of Henry Fawcett MP) and Carroun House in 1889. The land had been due for development but through the efforts of Octavia Hill and others was purchased by Lambeth Vestry. The Kyrle Society paid the costs of designer Fanny Wilkinson and the park was opened by the Prince of Wales in 1890. The gates and railings were designed by C Harrison Townsend. Only the gate piers survived wartime salvage but the gate has been replaced with a copy. Follow the path to the fountain then bear left passing model houses. Take the sand path to exit into South Lambeth Road and go right. Second right along Langley Lane. A former school has been converted to apartments. Bonnington Square was built in the 1870s for railway workers and in the 1970s the houses were compulsorily purchased by the GLC. Left empty, squatted then leased, in 1998 LB Lambeth enabled the residents to form themselves into a co-op in order to buy the property. The communal garden (open to the public) is on the site of WWII bomb damage which in the 1970s was laid out as playground. This fell into disrepair and in 1990 a builder applied to use the site for storage at which time residents formed a Garden Association with the aim of transforming it into a 'Pleasure Garden'. Money was raised by August 1994 and the garden was designed by local residents and an architectural firm. Planting mixes classic English and the exotic tropical including a walnut tree, banana and bamboo. Features in the garden include the Wheel, a 1860s industrial artefact rescued from a nearby marble factory. The Garden Association has since planted trees, vines and street gardens in the surrounding neighbourhood. As New Spring Gardens these first opened in 1661 and were initially free. When Jonathan Tyers took over in 1728 he added buildings and structural features and provided entertainment. The new Vauxhall Pleasure Gardens levied an admission charge but they were patronised by high society. The rehearsal for Handel's 'Music for the Royal Fireworks' was attended by 12,000 people. After Tyers death in 1767 they remained in the family and fireworks, ballooon ascents and tightrope walking events were staged. The gardens were sold to new owners in 1821 but from the 1840s there followed a period of closures and sales. They finally closed in 1859 following the building of the railway between Nine Elms & Waterloo and the rival Crystal Palace at Sydenham. The area was built over with housing, later cleared following bomb damage. Bear right between animal enclosures to Vauxhall City Farm. The farm was opened in 1977. Cross the gardens to exit at north west corner and take Glasshouse Walk under the railway. The name recalls the Vauxhall Plate Glass Works (1670-1780). In the Victorian period there were gasworks to the north and Guinness Trust Buildings to the south. Cross Albert Embankment at traffic lights to the right. Follow the riverside walk southwards. This was formerly the site of gasworks. The slipway is used by the amphibious vehicles of the 'Duck Tour'. 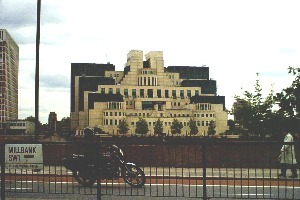 The distinctive MI6 building was designed by Terry Farrell & Partners in 1989-92. Vauxhall Bridge (1816) was originally cast iron. Its replacement was designed by Alexander Binnie and constructed in 1895-1906. There are bronze figures by FW Pomeroy and Alfred Drury depicting Science, Fine Arts, Local Government and Education on this side. The new development of St George's Wharf includes gardens. There is an information board and a view of the upstream figures depicting Pottery, Engineering, Architecture and Agriculture. Go up onto and cross Vauxhall Bridge. Go down to riverside walk (Crown Reach) and follow this southward. This emerges onto Grosvenor Road. Return to the river walk further along. There is a plaque marking where the Tyburn River enters the Thames. These include a statue of Huskinsson by John Gibson and The Helmsman by Andrew Wallace. Cross Grosvenor Road and go through St George's Square. This was originally two streets built in 1839 as part of the Cubitt development. To the west were a Military Store Depot and Cubitt's works. St Saviour's Church of 1863-4 was designed by Thomas Cundy II and has stained glass made by Clayton & Bell. Go right along Lupus Street then Bessborough Street. Right into Bessborough Place. Buonaparte Mews is on the right. The Tachbrook Estate was built on the site of a small arms factory and gasworks. Between these was the Kings Scholars Pond Sewer. Left at Balneil Gate. Go diagonally across Bessborough Gardens. This was the site of Holy Trinity Church designed by JL Pearson in 1849-52 and demolished in 1954 following bomb damage. Cross Vauxhall Bridge Road and Millbank to Riverside Gardens. These gardens were redesigned in 2004 to focus on the site's historical associations. They include 'Locking Piece' by Henry Moore. Continue along Millbank and cross into Atterbury Street alongside Tate Britain. On the left is the former Royal Army Medical College now housing Chelsea College of Art & Design. This together with the Tate Gallery and the housing estate occupies the site of the Millbank Penitentary (1821-93). The Millbank Estate was laid out by the LCC in 1897-1902. The garden is open to the public. Left at Page Street then right into St John's Gardens. This was the former burial ground (established in 1731) of St John's Smith Square and later the site of Thorne's Brewery and Westminster Hospital. On the corner premises a plaque records the Fegans Working Boys' Hostel built in 1912. Note the premises of Wippell & Co and Watts & Co, church furnishers and outfitters. At the end of the street enter Dean's Yard. Deans Yard, now a playing field for Westminster School, was the site of the abbey farm which included a mill, bakehouse, brewhouse and a granary to the south east. On the east side were the guest house and cellarers (1388-91) buildings, now part of the school. Enter the abbey precincts at the end. Follow signs or ask for directions to College Garden. Here fruit and vegetables, along with medicinal plants, would have been cultivated for the use of the abbey's infirmarer. It also served as an area for monks to relax and exercise. The building to the west is a dormitory for the school, designed by Wren and altered by Lord Burlington in 1734 but replaced after WWII bomb damage. Exit at the north west corner of Dean's Yard into The Sanctuary. George Gilbert Scott designed the memorial column to Westminster scholars killed in the Russian and Indian Wars 1854-9. The church was founded in the 12th century by Benedictine monks so that local people who lived in the area around the Abbey could worship separately at their own simpler parish church. It was rebuilt from 1486 to 1523 and later alterations were made by John James, JL Pearson and George Gilbert Scott. It has a large number of memorials. Beyond the church cross towards the Palace of Westminster and go left along the east side of Parliament Square. Cross Bridge Street to Westminster tube station. Wharves and factories including the London Hydraulic Power pumping station, Westminster Electricity Supply Corporation and Hovis Bread Flour were cleared for these gardens in 1912. The colourful fountain designed by SS Teulon in 1865-6 is an anti-slavery monument. Take the path to the statue group of the Burghers of Calais by Rodin. Continue along this path. There is a statue to suffragette Emmeline Pankhurst and a medallion to Dame Christabel Pankhurst. Exit into Abingdon Street and go right. To the left are views of the Jewel Tower, Westminster Abbey and St Margaret's Church. The church was founded in the 12th century by Benedictine monks so that local people who lived in the area around the Abbey could worship separately at their own simpler parish church. It was rebuilt from 1486 to 1523 and later alterations were made by John James, JL Pearson and George Gilbert Scott. It has a large number of memorials. Continue along the east side of Parliament Square. Cross Bridge Street to Westminster tube station.